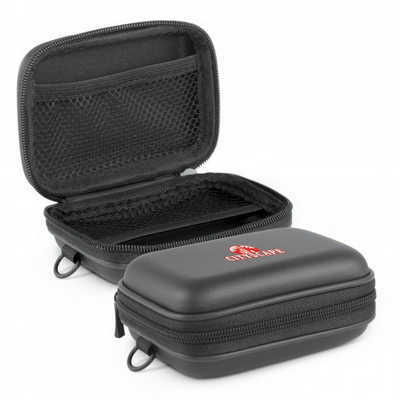 Small EVA carry case designed for storing a power bank along with charging cables and accessories. It will hold the Dalek, Edison, Electra, Flare Torch, Hypertron, Megatron, Phaser, Pulse, Sabre, Tesla, Proteus 2000 and Vader power banks. Colours: Black. Dimension: L 120mm x W 88mm x 46mm. Print Description: 65mm x 30mm. Print Type: Pad Print. Packing: Loose packed. Price includes : 1 Col 1 Pos Print. Setup is included.